From there, she helped to form a Justice Warriors club at her school. The group helps make sleeping mats out of milk bags and sells popcorn. “It feels so good just to help people,” says Visutski. 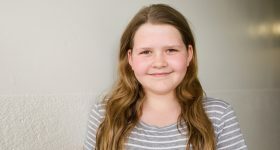 She is the fourth Our Lady of Fatima student to be representing Renfrew County at Queen’s Park since the program was introduced eight years ago. MSAC celebrates student diversity and encourages appointees to speak up and take action on topics and issues that will strengthen student engagement across the province. OLF’s first council member was Kailyn Friske who was keen about active play. A couple of years later, Foster McIntyre joined MSAC with passion for the arts. In 2013, Connor Dowdall represented students showing an interest in using technology to support learning. Although each has had different areas of interest, Armstrong says the former MSAC members have all been incredible advocates for the students of Renfrew County. As part of the council, Visutski attended her first meeting on Thursday, May 4 in Toronto and will be attending a week-long leadership camp in August.